thor and mother's day. | escaped. So yes, we're actually lucky to have found an apartment next to a shopping mall (double YAY for meee) regardless of the poor condition of the mall. This place is actually famous for its frequent visitors of kaki lepak and mat rempits. Atil, hold it. *breathe* I might spend an entire day ranting about this, because it's really sad seeing these teenagers spending the luxurious time of their childhood just sitting and chatting away and phewwit-ing at strangers. I find them very disturbing, seriously - makes me realize just how grateful I am my brother is none like that - and how I pray to God that he'd never turn out like that. Feel like marching over there and yelling at their faces, 'GO HOME TO YOUR FAMILY LA!!!!' Poor parents. Anyway. The cinema wasn't that bad, despite the negative first impression we had. This is my first time watching movie in Malaysia since I got back from Japan, so I went a bit jakun. Housemates No 1 and 2, Syikin and Pija. Please excuse my messy scarf - wasn't bothered to dress up at all. We watched Thor. It was amazingly not boring at all - the three of us were laughing like nobody's business. I think we just wanted to get that work stress out of our system. Go watch it now, if you're looking for that blend of handsome warriors, humor and light action movie. Anyway, tomorrow's Teacher's Day. Last few weeks was Mother's Day, which I've completely forgotten to write about! 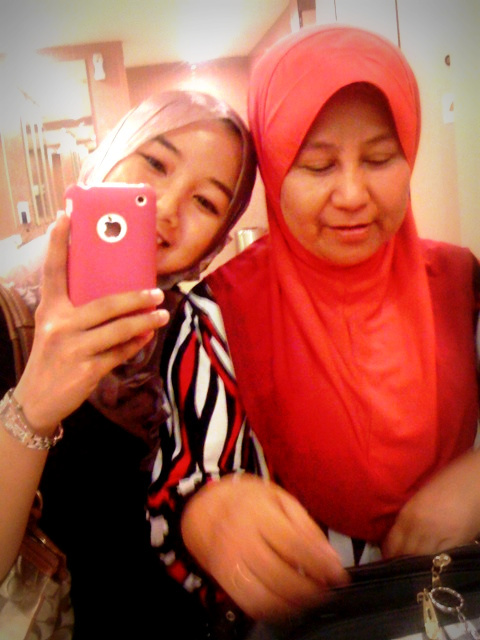 Things I teach my mum, camwhoring at the nicest ladies room in a mall.